Welcome to the online home of Brent Nichols, author of the Gears of a Mad God series of steampunk/Lovecraft novellas, the War of the Necromancer sword and sorcery trilogy, Bert the Barbarian, and more. 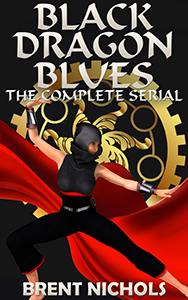 [November 13, 2015] Black Dragon Blues is now on sale at Amazon only. You can get the paperback or the ebook. Fantasy and Science Fiction $0.99 sale! [December 31, 2014] A gorgeous selection of fantasy and science fiction novels (including Bone Magic by yours truly) is on sale January 1 at http://pattyjansen.com/blog/mad-science-fiction-january-sale/ or http://wp.me/P3P8B7-138. Some titles are only marked down for one day, others for longer. There are some excellent books listed, and I know I'll be picking up a few. Check it out. You won't be disappointed. [November 27, 2014] The Goblin King is now live on Amazon, Barnes and Noble, Smashwords, Createspace, and Itunes. When a dead king rises to reclaim his throne, Tira Archer and her companions see the hand of a dark sorceress behind it. 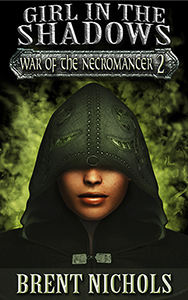 They've sworn to finish the necromancer who's brought so much murder and destruction into their lives, but it won't be easy. They'll face assassins, a charming rogue with a hidden agenda, and an army of idealistic rebels who've sworn loyalty to a king ten years dead. Now they must ride into a goblin-infested wilderness and battle renegades and mercenaries to reach a mad sorceress and try to stop her before she can plunge an entire kingdom into war. 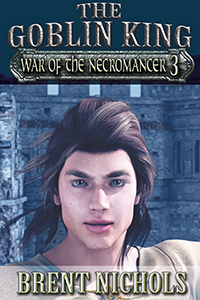 They will pay a terrible price, but one way or another, the sorceress WILL be stopped. [July 27, 2014] Girl in the Shadows is now live on Amazon. In the next few days it will appear at Barnes and Noble, Smashwords, Createspace, and Itunes. 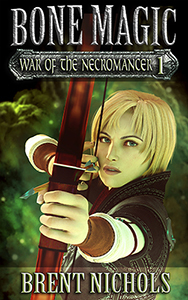 Tira Archer is hunting a monster. She's after a necromancer who uses the dead as puppets in her mad schemes. Tira has sworn to take the sorceress down, no matter what the cost. She gets sidetracked when she meets Su, a fugitive on the run from some nasty bounty hunters. Then she meets Alerak, a vengeful nobleman who thinks Su is a murderer, and Roth, a former assassin turned priest, who's been given the task of hunting down the real killer. By the time they realize they're all pawns in a dark conspiracy, Su is in a cell, scheduled for execution, and Roth is in the clutches of an old enemy. Tira senses the hand of the necromancer behind it all. This could be her chance to stop the woman once and for all. All she has to do is rescue Su from the gallows, pluck Roth from the clutches of vicious pirates, keep Alerak from blundering into a deadly trap, and lead the entire motley group in an assault on an impenetrable fortress. The only sensible thing to do is to ride away, but Tira's in too deep to stop now. It'll take more than an outraged noblewoman with a squad of cavalry, a band of river pirates, and a flying ship full of mercenaries to stop Tira. She's going to bring down a necromancer, and may the gods help anyone who gets in her way! [July 18, 2014] Bone Magic is now live on Amazon, Barnes and Noble, Smashwords, Createspace, and Itunes. The war was supposed to be over. Tira Archer was supposed to be going home. But children are disappearing from the peaceful village of Raven Crossing. Tira searches for the children and finds vicious kidnappers, goblin armies, and mercenary dwarves. A war is brewing, and not just any war. It's a war where the dead don't stay fallen. Hurt, exhausted, and sick of fighting, Tira will have to take up her bow once again. Somewhere there is a dark wizard manipulating the living and controlling the dead. Tira is saving an arrow just for him. He plans to rule the world, but he hasn't planned on Tira Archer. Book Two in the trilogy is in final edits and will be going live by the end of July. Girl in the Shadows picks up where Bone Magic ends, and introduces three new characters who join Tira on her quest to stop the necromancer. Look for Girl in the Shadows sometime in August. The series wraps up with The Goblin King, which is finished in a rough draft. I expect to release it in September, along with a money-saving omnibus edition of the complete trilogy. Sign up for my mailing list if you want to know when new books are released. I'm in the Kindle Matchbook program, which means you can order a paperback of any of my books and get the Kindle version for free. [March 4, 2014] Genrepub is a cool website offering a carefully chosen selection of genre fiction for sale. There are articles, blog posts, short fiction for free, sample chapters from some pretty good novels, and some quite cool books for sale. They've just launched the site, and the first-quarter theme is steampunk. [January 17, 2014] Airship Down is now live on Amazon. This brings the "Airship War" trilogy to a close. If you've been waiting for the omnibus edition to save a bit of money, it's available too. Links are here.